A high-spec/low-cost pedal that's sure to get your creative motor running. The Chinese-made Movall Rock Highway has more than one engine beating away under its hood. 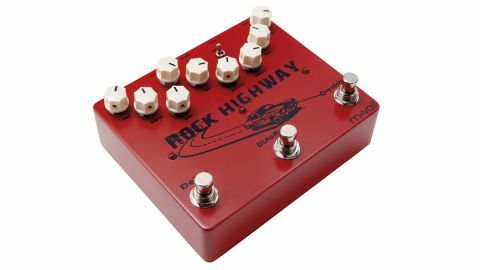 What we have here is three pedals in one, with independent overdrive, distortion and delay circuits, each wired to a trio of dedicated controls and an on/off switch. Actually, all three effects sound fantastic. The overdrive comes over like a classic Tube Screamer, transparent yet with a bit more grunt. The distortion is thick and warm, and not a million miles from the EVH's Brown Sound, while the delay goes from slapback to canyon with vintage delivery. You can use the effects solo or together. What's more, you can choose to run the overdrive into the distortion circuit or vice versa with the small OD/DIST switch. We prefer the former setup where the overdrive adds gain to the distorted tone without compromising clarity and note separation.